The Philadelphia Phillies met with superstar Bryce Harper in Las Vegas on Saturday, according to Matt Breen of Philly.com. Although the two sides didn't walk away with a deal in place, the Phillies "remain optimistic" they'll end the offseason with either Harper or fellow superstar Manny Machado on the roster. Per that report: "The Phillies are going to be finalists for both Harper and Machado. 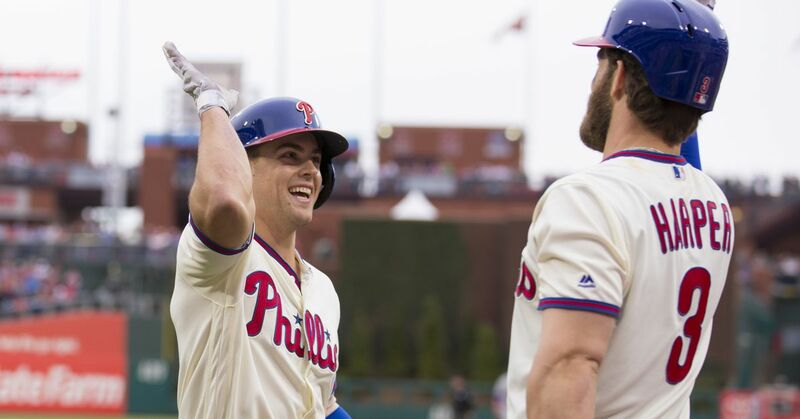 They will most likely be extending the most lucrative offers to both players, which means for the Phillies to lose out on landing a superstar, both players will have to take offers for less money to play elsewhere." Breen also reported the Phillies "seem to prefer" Machado. Either player would give them the biggest superstar they've had since the days of Chase Utley, Ryan Howard, Roy Halladay, Cliff Lee, Cole Hamels and Jimmy Rollins. The Phillies have failed to reach the postseason since the 2011 season and haven't posted a winning season in that time. They were in the running in the NL East for much of 2018, though a late-season collapse saw them finish 80-82 and well behind the Atlanta Braves. While the Phillies have a talented young core, they lack a truly elite player, outside of perhaps starting pitcher Aaron Nola. Machado is capable of playing both shortstop and third base, though the Phillies traded for Jean Segura this offseason, ostensibly to cover shortstop. Machado is a four-time All-Star and two-time Gold Glove winner who has hit at least 33 homers and 86 RBI in four straight seasons. His ability to play both positions on the left side of the infield arguably makes him the slightly more valuable player. There's no disputing Harper's star power, however. He has won the Rookie of the Year and MVP in his career and is a six-time All-Star. He's hit 20 or more home runs in six of his seven seasons, and his MVP campaign in 2015 was epic, as he blasted 42 homers, 99 RBI and scored 118 runs while hitting .330. He was likely on his way to another MVP award in 2017, with 29 homers, 87 RBI and 95 runs in 111 games, though a knee injury cost him a chunk of the year. Either player would upgrade the team's lineup in a significant way and offer a marketable star to build around. With the additions of players like Segura, Andrew McCutchen and David Robertson this offseason, the Phillies have been putting solid pieces into place. Machado or Harper would put the cherry on top of a solid offseason and put the Phillies back in the running for a postseason berth.